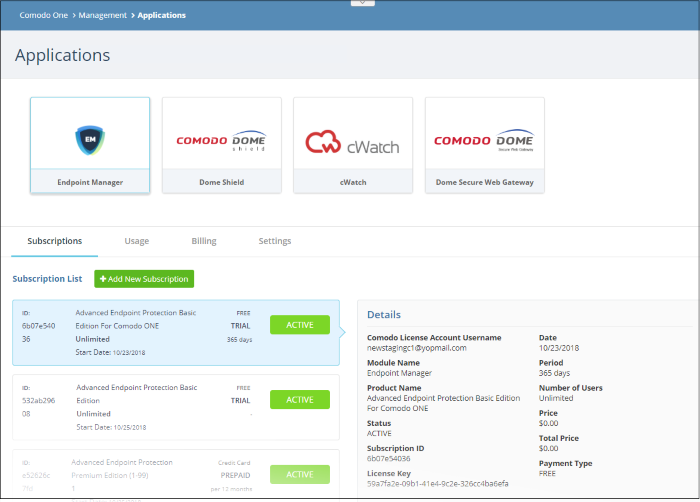 The 'Subscriptions' tab shows details about licenses you have purchased for Comodo One applications. Details include whether the license is active or not, the start date of the subscription, the name of the product and more. Click the 'Subscriptions' tab to view the list of licenses for that application. Shows all your licenses for the selected product. Each license row contains basic information such as license name, type, duration, start date and user/endpoint allowance. Click a row to view more details about the license. Comodo License Account Username - The email ID associated with the account for which the license was originally purchased. Module Name - The name of the application. Product Name - Indicates the name, duration and user/node allowances covered by the license. Status - Whether the license is active or not. Subscription ID - The identification number provided for the subscription. License Key - License key of the subscribed product. Date - The date of subscription. Period - The license validity period. Number of users - How many end users are covered by the license. This is applicable for products where end users are to be enrolled such as Endpoint Manager. Price – The base price of the product. Total Price – The total price paid for the product. This depends on the number of users, number of nodes and validity period. Payment Type - Indicates how payment was made for the product. Click 'Add New Subscription' to renew, buy or add new license for the module. See 'App Store' for more details about the license purchase process.